Probably the most iconic feature of the city, and one that makes it instantly recogniseable on photos. The towers of Cologne Cathedral dominate the skyline, and you’d never tell that one spire is a tiny 7cm taller than the other. 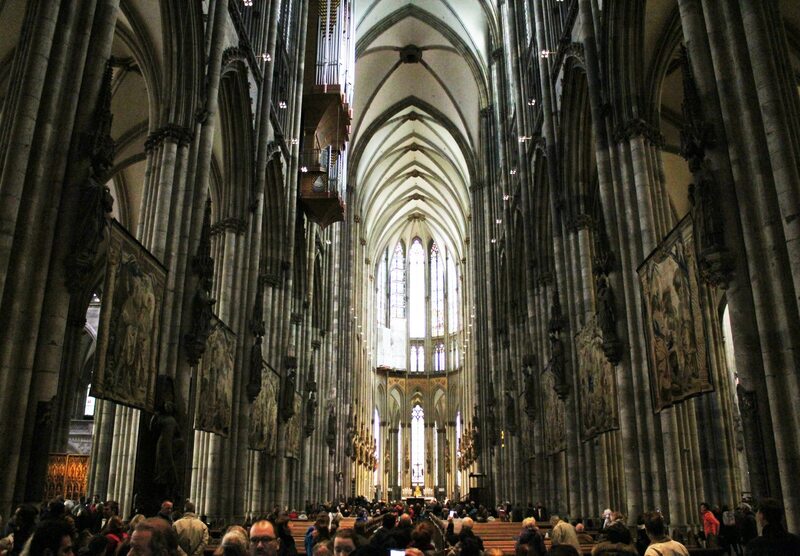 The gothic cathedral with it’s intricately detailed architecture is a must visit! The walk around inside is free, with a number of unique focal points the whole way around. The tapestries hanging between the pillars frame the pews, the giant golden pulpit is hard to miss, and of course the stained glass windows. Light a candle for a friend, family, or special cause and give a charitable donation. Almost as recogniseable as the cathedral, but often seen on the same typical photo the Hohenzollern Bridge stretches across the Rhine, and when travelling by train it’s from here that you will get your first glimpse of the city. 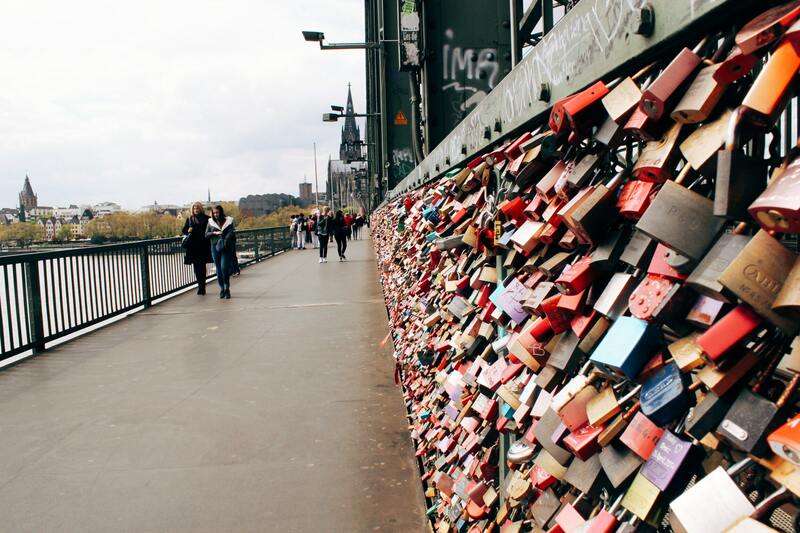 Attach a love lock to the thousands already lining the bridge and throw the key in the Rhine, or simply enjoy the view of Cologne from any point along the walk. Some of the best photos can be taken once across the other side. Top Tip – take your own lock and key as I couldn’t believe that unlike Paris, there are no vendors or stalls selling them! One that the chocolate lovers cant miss! Set on it’s own little island in the Rhine, the swing bridge limits the number of people that can access the museum at any one time. You’ll be met with the giant gold rabbit sitting on the roof, and can buy your tickets on the day once inside. If you dont want to do the tour, a visit is worthwhile just for the cafe! 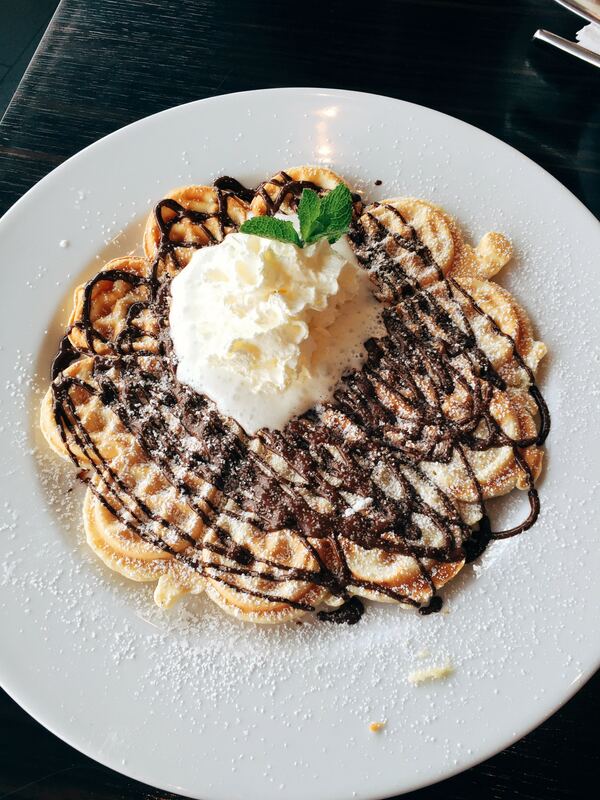 Enjoy a hot chocolate, chocolate cake, chocolate waffles…anything chocolate with a view out of the full length glass windows facing the river. 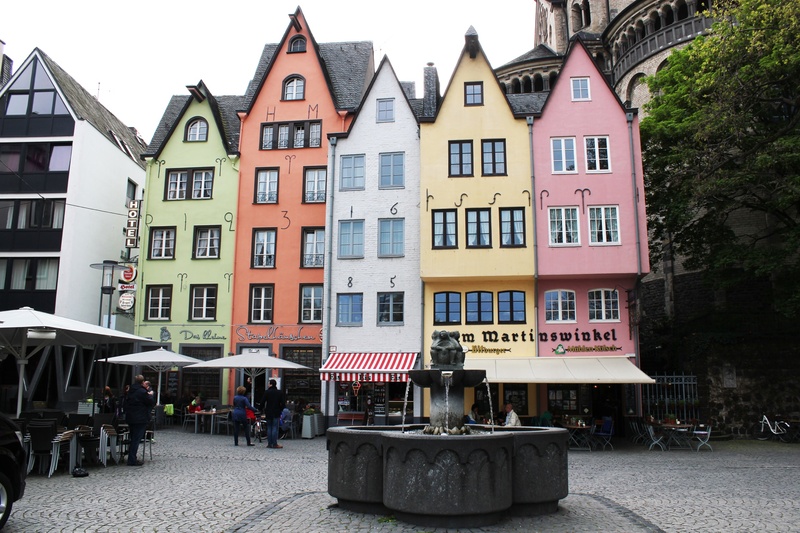 I wanted to experience the old town more than anything else on my agenda before I arrived in Cologne, and the charming area and colourful houses didn’t disappoint. The row of houses have been rebuilt so many times, especially after the Second World War, and they stand facing the little cobbled square in front of St Martins Great Church. Most are now restaurants, and the history of their development is on display on the walls of the orange house, but the blue house is an ice cream shop! Serving traditional flavours mixed with new creations it’s well worth a visit. Trying to find the Hahnentor, or Royal Gate was worth the walk just for the beautiful streets you will pass through, and you’ll really get a glimpse of German architecture as well as different areas of the city. 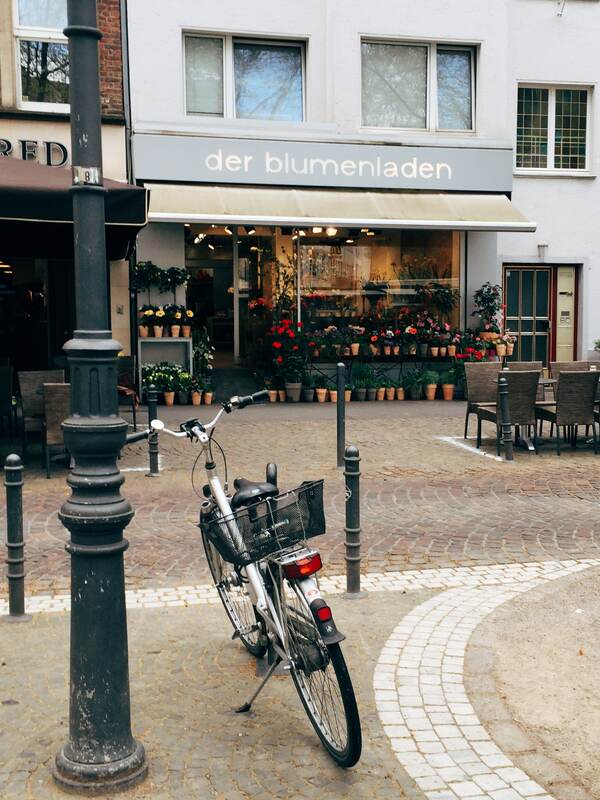 Unless you want to go shopping in the same shops you find back home, quickly pass through the shopping area, but allow yourself the time to enjoy the prettier and more affluent area of Rudolfplatz. Boutique stores and fancy cars line the streets, but once at the gate you can enjoy the markets often being held in front of it, or have a coffee break at one of the cafes opposite. Brewed only in Cologne you wont find it cheaper or tastier anywhere else! Easy to drink you probably won’t order much else while you’re there, ‘Zwei kolsch’ was our most used phrase of the trip. 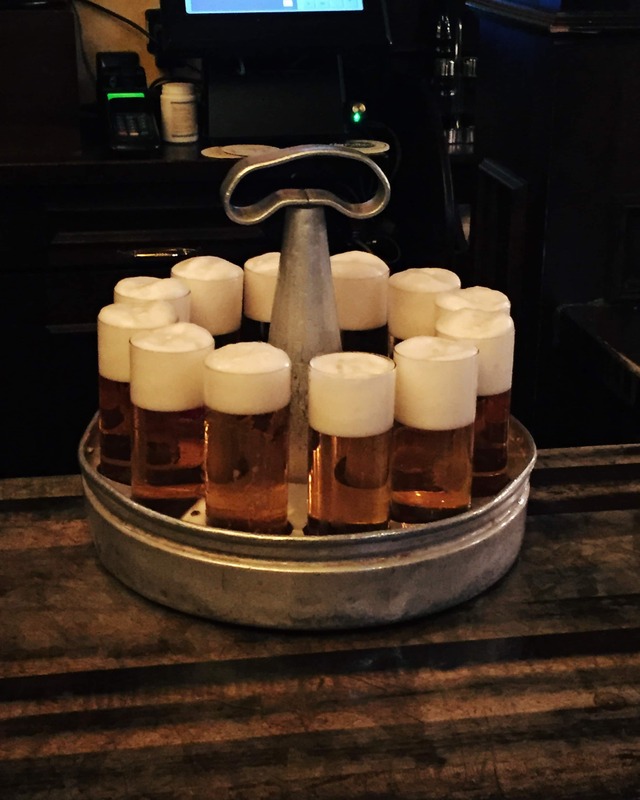 Available everywhere but nowhere served it better than a real German Bierhaus. The old town had plenty to choose from, but Bierhaus in der Salzgasse was the only one we found that wasnt dominated entirely by men. 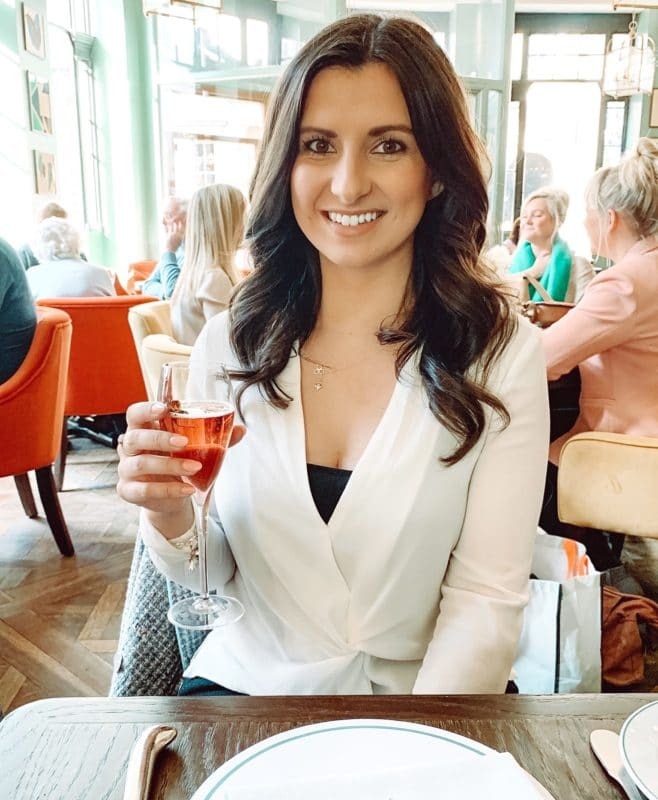 I felt comfortable being in there and there were plenty other women and families enjoying the snacks as well as the beer. 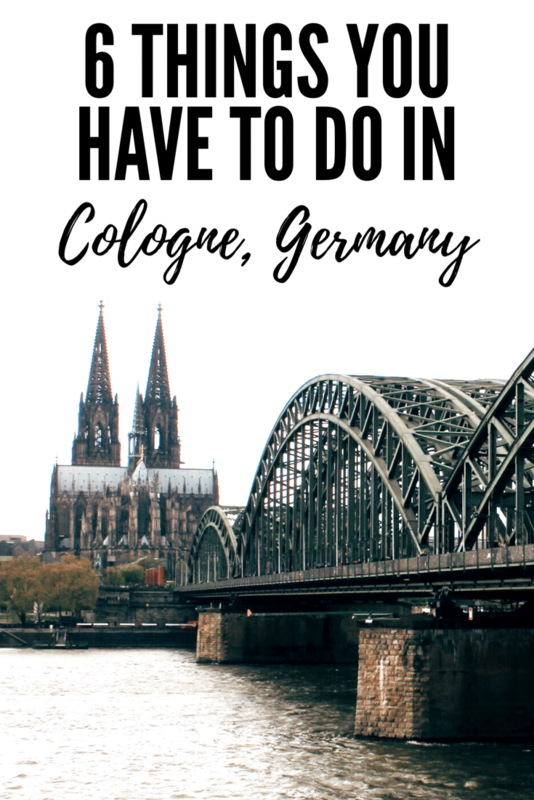 These were all the places I went to as part of my 3 day trip, but when I was researching all the things to do in Cologne before I went, there are plenty more I didn’t get chance to visit on this occasion. Here are a few that I would make a priority if I went back. Directly over the River Rhine from Rheinpark you can take a cable car from one side of the river to the other. I would love to do this for a birds-eye view of the city at sunset! These thermal baths, saunas and wellness centre are located in Rheinpark, with a view of the cathedral. I didn’t have time as it would take a full day but this is definitely something I’d look to do as part of a longer trip. Another one to do as part of a longer trip, just half an hour train from Cologne is Bonn, a medieval town known for being the birthplace of Beethoven. Famous for the composers home which you can go and visit, it’s also home to one of those Insta-famous destination photos of the blossom trees! 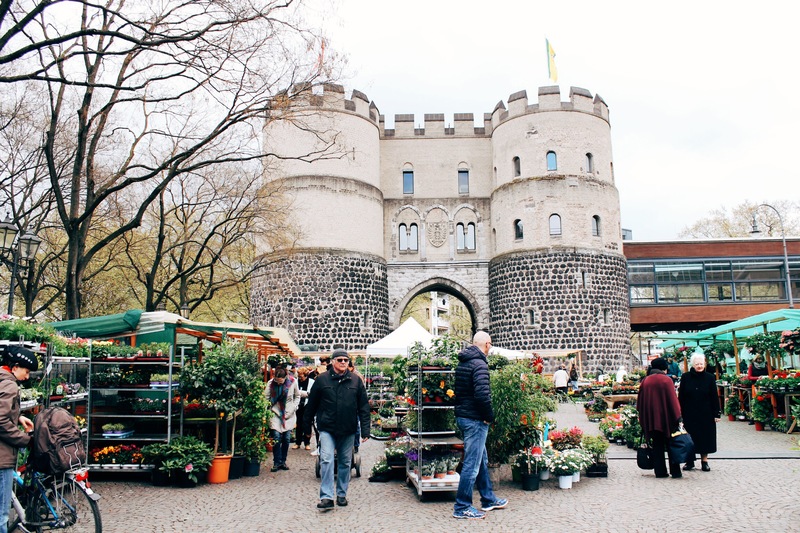 Pin ‘6 things to do in Cologne, Germany’ for later! Reading this makes me super excited for my trip to Cologne! Thanks for sharing!